This document has been drawn as a grazing lease, for letting fields (that may have buildings on them such as stables, barns animal shelters or other outbuildings) to private individuals or businesses to keep horses or other animals. The document contains specific provisions to ensure that the land is well maintained by the tenant. It is also flexible enough to be used to let rural land for other purposes, such as recreational riding, a camp site business, or a sports field. It is drawn under the Landlord and Tenant Act and therefore is unsuitable if the land is to be used for 'agricultural' purposes. 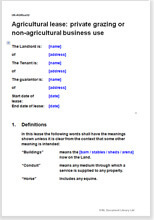 This is a lease of agricultural land (one or more fields, perhaps with buildings or shelters) to be used for personal use or non-agricultural business use. This document is suitable as a grazing lease for horses or other animals. The landlord may allow the tenant to use the land in other ways too, and not necessarily for grazing. This document creates a lease under the Landlord and Tenant Act and property laws. Should you choose this grazing lease, a license, or a farm business tenancy agreement? There are extensive positive obligations on the tenant on how the land should be maintained. We presume that if used for grazing, the land being let is of high quality. The obligations should help it remain so. Use for all states of Commonwealth of Australia.